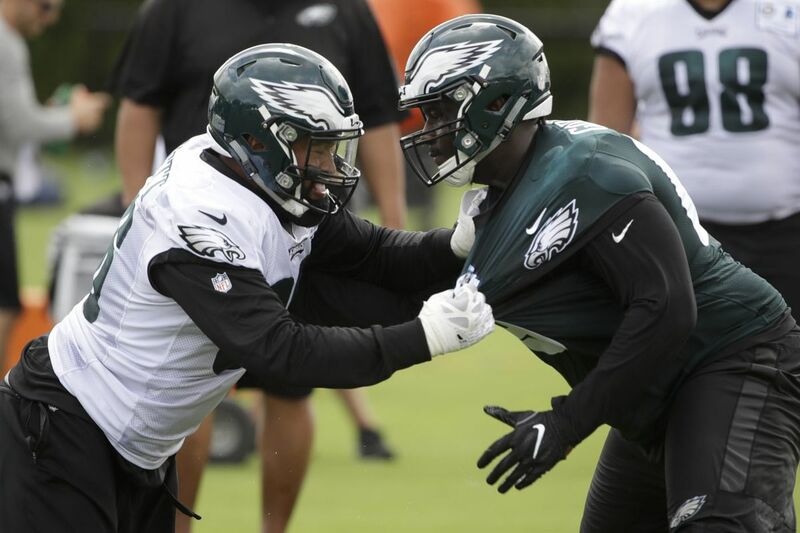 Philadelphia Eagles defensive end Derek Barnett, left, and offensive guard Dillon Gordon battle during training camp. The latest damning evidence that the violent hits pro football players take make them more susceptible to brain injury should lead not only the NFL but college, high school, and youth leagues to reassess how the game is played. A neuropathologist who examined the brains of 111 former NFL players found all but one of them had suffered chronic traumatic encephalopathy, or CTE, a degenerative disease believed to be caused by repeated blows to the head. Previous studies have also demonstrated a connection between football and CTE. The NFL denied the link for years until finally admitting its existence in testimony before Congress last year. But the league has taken only meager steps to protect players by limiting the amount of hitting in practice, developing safer helmets, and penalizing players who hit an opponent in the head. Pro players by now should be more aware of the health risk, though the potential for huge paychecks and fame may be too great for many to pass up. They should consider the growing list of former NFL players known to have had CTE who died or committed suicide. Other former players blame their dementia and depression on CTE, but that can't be verified until a person dies and his brain can be examined. Hall of Fame Oakland Raiders quarterback Ken Stabler, who died in 2016, had CTE. So did Kansas City Chiefs linebacker Jovan Belcher, 25, who killed his girlfriend in a murder-suicide in 2012. Another Hall of Famer with CTE, Junior Seau, who played for the San Diego Chargers, Miami Dolphins, and New England Patriots, fatally shot himself in 2012. The deaths have prompted others to reconsider their choice of career. Fearing a brain injury, San Francisco 49ers linebacker Chris Borland retired after his rookie season in 2015. "You've got to look after yourself because, really, nobody else will," said Denver Broncos linebacker Brandon Marshall. He's right, but the advice isn't just for NFL players; it's also for parents whose kids play football at lower levels where the equipment and medical treatment is often not as rigorous. Ann McKee, the neuropathologist who studied the brains of 111 deceased NFL players also examined the brains of 58 former college football players who never played professionally and found 48 (83 percent) of them also had CTE. The director of the Boston University CTE Center also found indications of CTE in the brain of a high school player who was 17 when he died. A Green Bay Packers fan, McKee said she would not let her child play tackle football. The federal Centers for Disease Control and Prevention estimates 135,000 children ages 5 to 18 are annually treated for sports-related brain injuries. Many of the injuries are concussions. Children can seem to recover, but the long-term health risks of multiple concussions or repeated head blows is unknown. Playing football can build character, teamwork, and physical fitness. But the injuries can be devastating. The NFL can do more to protect its athletes. But parents with children playing football at lower levels must be fully informed of the risks so they can make the right decision for their child's well-being.